As part of her thesis project, Feminist Urbanism, DUE student Gabriela López Dena is organizing a workshop in partnership with Interference Archive and Art and Feminism. 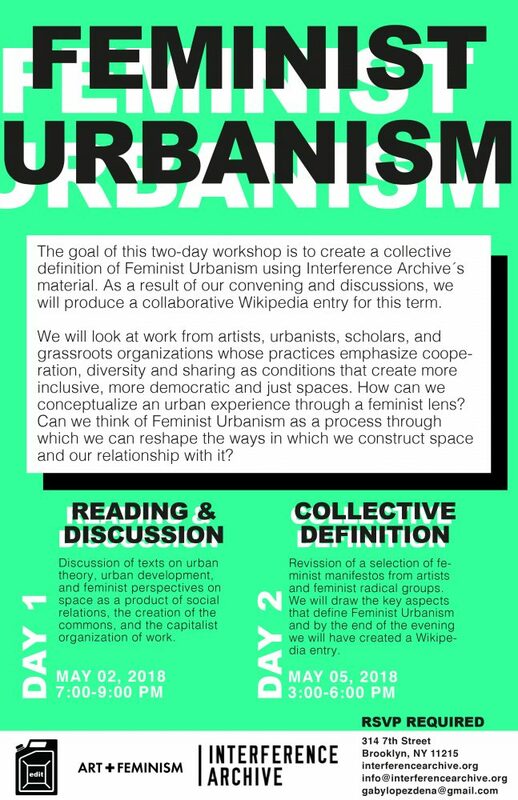 Feminist Urbanism is proposed as a five-issue magazine seeking to foster collaboration between existing social, spatial and artistic practices led by women in New York City. The different volumes will be exploring themes such as spatial politics, production of space, economy and labor, domesticity, and class structure. The publication will result from a series of events –workshops, conversations and dinners–that are distilled through diverse outcomes created at the events. This magazine is thought of as a container for those engagements, and intends to operate as a bridge and space of interplay between those seeking ways to build new urban ecologies and coalitions for action. Included in Issue 1: What is Feminist Urbanism?, this two-part event will lead to the creation of a collective definition of Feminist Urbanism using the material from Interference Archive. Exploring work from artists, urbanists, scholars, and grassroots organizations the attendees will produce a collaborative Wikipedia entry with this concept. Please email gabylopezdena@gmail.com or info@interfeencearchive.com to RSVP and get the reading materials. Categories: Student Events, Thesis, and Upcoming Events. « XRC Labs Cohort 5 Application – Due Tomorrow 11/3!